Having seasonal items in and around your home, whether it be holiday decorations, patio furniture, or lawn and garden ornaments are a great way to add warmth and feeling all year round. The only problem with switching up your decor as the seasons change is having a place to store the items you are cycling out of rotation. For most families, storage space is at a premium and new and inventive ways to stuff this and that into any available nook and cranny are always being sought. Fortunately, there are storage options that can make remove stress from the situation. 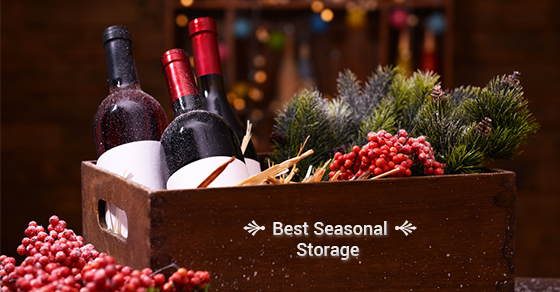 Here are the 3 best options for seasonal storage. Self-storage units. A self-storage unit can be a budget friendly and convenient way to store those items that really only make an appearance once a year. Most self-storage facilities come with round the clock surveillance and make sure that your items are safe and secure. All you have to do is ensure that your unit is organized and that delicate items or sensitive materials are properly wrapped, covered and protected. Hanging storage. Hanging storage, suspended from the roof or rafters of an attic or garage are some of the most convenient storage solutions available. These are easy to install, effective in utilizing vertical space and take the hassle out of storing and retrieving bulky seasonal items. One thing to keep in mind is the load capacity of the structure you are suspending these from. Most large hardware and home improvement stores offer these storage devices in multiple weight capacities and color schemes. Under the deck or patio. Storing items under your home’s deck or patio can be a double edged sword. Sure, things are kept out of sight and out of mind during the off-season, but moisture and exposure to the elements make many people think twice about keeping things undercover outside. There is a simple solution to this: Shrink wrap. Many people keep machinery and equipment outside, year round, covered in shrink wrap. Even if you are just storing Christmas lights, or plastic/metal lawn ornaments with few moving parts, shrink wrap is a good way to make sure that there is a reliable, impermeable membrane protecting them, and it lets you utilize space under your house, freeing up more valuable space inside for items that truly need to be kept indoors year round. When available space is in short supply, storing seasonal items around your house, especially decorative and non-essential ones that add clutter, can seem frivolous. The trick is to seek out unused vertical space, make some simple purchases to accommodate storage, or look outside of your home for temporary, off-site personal storage – this will allow you to go the whole year knowing that everything you need for all four seasons has its own, secure, unobtrusive place.